The fear is that populism, Italian style, has achieved power. But neoliberal policies rule more than ever, tinged with populism, opening the way to Lega’s far-right, racist (and neoliberal) politics. April, 2018 in Rome. Matteo Salvini, League Party secretary, during a second round of consultations of political parties for the formation of the new government at the Quirinal Palace. Giuseppe Ciccia/ Press Association. All rights reserved.A new Italian government is in the making, with an unprecedented alliance between the Five Stars Movement (33% of votes in the March 2018 elections; 36% of seats in the House of Deputies) and the Lega (17% of votes; 20% of seats). The view that ‘populist barbarians have conquered Rome’ is a gross misunderstanding. 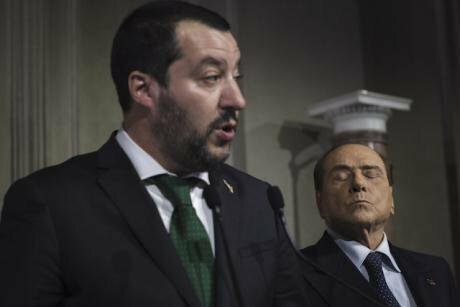 Lega has already governed for nine years in Berlusconi governments supporting every neoliberal policy that has favoured finance, business and the European integration they now criticise. The Five Stars are ready to compromise on everything with anyone – Washington, Brussels, business, finance, the military – for their turn in power, knowing that their large support is at best temporary. The result – rhetoric aside – is that pro-rich neoliberal policies dominate the new government agenda, tinted with a shade of populism, offering modest pro-poor and harsh anti-immigrant action. Lib-pop politics is how we might describe Italy’s new political experiment. The Five Stars are ready to compromise on everything with anyone... knowing that their large support is at best temporary. The clear political winner is Lega’s leader, Matteo Salvini, who has turned the Northern ‘separatist’ Lega Nord into a nationwide nationalist, reactionary party, mirroring France’s Front National. He quadrupled Lega’s votes (in 2013 they were 4%); in Northern counties of Lombardy and Veneto Lega reaching 33 to 38% of the votes, with the centre-right coalition well over 50% (an analysis of the election results is here). He ran in a centre-right coalition where he emerged as the clear leader, with the Lega obtaining more votes than Berlusconi’s Forza Italia (14%) and the post-fascists of Fratelli d’Italia stuck on 4%. He managed to obtain from his coalition partners a green light for the government alliance with the Five Stars, thus keeping together – in spite of squabbles – a coalition that last March had procured 37% of votes and is close to obtaining in any future election an overall majority of seats (within reach if they obtain about 42% of votes under current electoral rules). His centre-right allies promised mild opposition and parliamentary support for the (many) policies they will like. Salvini is in the unique position of leading from the extreme right a broad centre-right coalition that includes moderates and élite groups; in no other major European country does such an alliance exist. Salvini is in the unique position of leading from the extreme right a broad centre-right coalition that includes moderates and élite groups. The political momentum for Salvini grew with the elections in two regions held in April 2018. Lega won in the north-eastern region of Friuli-Venezia Giulia with the centre-right coalition getting 63% of votes, Lega alone obtaining 35% and providing the President of the Region, while the Five Stars slipped to 7%. In the small Southern Molise region, the centre-right coalition won with a Forza Italia candidate on 49% of votes (Lega had 8%), while the Five Stars list obtained 32%. Current polls reflect this trend of a growing Lega and a stable Five Stars consensus; when Five Stars support weakens – as happened in the peripheries of Rome and Turin, run by weak Five Stars mayors – Salvini is set to grab a large part of their disappointed voters. Thus, the political outlook suggests Salvini as a likely winner of a real majority for the centre-right whenever new elections take place, giving him the upper hand in talks for the new government – the alternatives being an early vote in autumn or in May 2019 when they could be held together with the European elections. Finally, Lega’s hegemonic power is marked also by its ability to combine power and protest; it was in power throughout all Berlusconi’s governments, but is not perceived as responsible for the current crisis. At the same time, Lega capitalises on widespread protests with its rhetorical challenge to European rules, harsh treatment of migrants and anti-tax, anti-bureaucracy agenda. Among the Five Stars of the movement founded by Beppe Grillo, no ‘pole star’ for its political project has been found; the only priority now is to claim power, regardless of type of alliance and programme. Anti-corruption and bottom-up democracy remain little more than background noise; 94% of Five Star supporters approved the government programme in one afternoon’s electronic voting; top-down decisions on policy priorities far from the Five Stars’ traditional demands have not been challenged by the grassroots; only a left-wing prospective labour minister, Pasquale Tridico, resigned after the programme was announced. The difficult search for a Prime Minister different from the Five Stars leader Luigi Di Maio reflected the political fragility of a top-down model preventing the emergence of a broader political leadership. The fundamental weakness of the Five Stars is in their very post-ideological posture. With the political ‘caste’ as their main enemy, and the illusion of moving beyond the left-right divide, they have yet to learn how to use political power to deal with contrasting class interests, and how their policies may sustain or destroy their electoral consensus. Five Stars have yet to learn how to use political power to deal with contrasting class interests, and how their policies may sustain or destroy their electoral consensus. In contrast, the Lega has strengthened its right-wing ideological roots, providing identities and a worldview for its voters. No surprise then that many working class and poorer Italians, after welcoming the anti-establishment nature of the Five Stars, are now ending up as Lega voters. The asymmetry between a Lega with clear priorities – in terms of class and nation – and a Five Stars with its only concern to strike a deal, has produced a government programme that includes some general concerns of the Five Stars – on legality and minimum income - and most practical measures designed by the Lega - on taxes and migrants. Demands for renegotiating European treaties and restoring national sovereignty in some areas are enough to open up a rhetorical confrontation with Brussels – and much attention from the media. But they have little concrete content. The most important specific policy that will be introduced by the new government is the Italian version of the ‘flat tax’; firms and individuals will pay either 15 or 20% of income taxes, as opposed to the current 43% for the top income bracket. It is clearly stated that no wealth tax will be introduced (Italy has often been criticized by the EU for having cancelled real estate taxes on home-owners). Tax controls on Italy’s large number of small firms and self-employed will be scaled down, basically legalising tax evasion for a large number of right-wing, medium and high-income voters. Tax controls on Italy’s large number of small firms and self-employed will be scaled down, basically legalising tax evasion for a large number of right-wing, medium and high-income voters. For financial firms and banks no control or limit on their activities will be introduced. This will make Italy a neoliberal business paradise, competing with Ireland in the race to the bottom of business taxes in Europe, offering some room for the survival of Italy’s small businesses dramatically hit by a decade of crisis. In this way, the transfer of income to the richest 20% of Italians will be huge, with the very rich benefiting the most. Berlusconi would have never been able with his past majorities to introduce such a pro-rich agenda. Such measures are the easiest to implement, as they simply scale back state redistribution, leaving unequal outcomes of market processes untouched. More difficult is the implementation of the only ‘pro-poor’ measure long championed by the Five Stars: the so-called ‘citizen income’. In the programme this is reduced to an income support of €780 a month for a maximum of two years for unemployed Italians (no residents with foreign citizenship will obtain it) ready to accept any job offer; no figure for potential recipients or funding for implementing it is mentioned. Berlusconi would have never been able with his past majorities to introduce such a pro-rich agenda. But the darkest success of the Lega in the government programme is the chapter on migrants, envisaging a stop to the flows of refugees, changes in European rules on asylum and free movement, and proposing the repatriation of the 500,000 immigrants with irregular status now present in Italy. Combined with harsh measures on law and order, this policy caters to the ‘fear effect’ that is behind the growth of Lega’s support. In parallel the rise of the Five Stars was based on a ‘poverty effect’ – especially in the South (see here). The tragedy is that the poorest Italians have overwhelmingly voted for two political forces that are now creating the most pro-rich, pro-business government in Italy’s history. Even worse, Lib-pop politics could be just the starter for an outright far-right political future. This article was originally published on Social Europe on May 21, 2018. The Italian version is here.